As rivers and taps run dry, water has the potential to become a major flash point between India and Pakistan. Pakistan, India and Afghanistan are among the world's eight most water stressed countries. Women and children walk miles each day in search for water in a crowded, downtrodden district of Pakistan's financial capital, Karachi - a scene repeated in cities throughout the country. 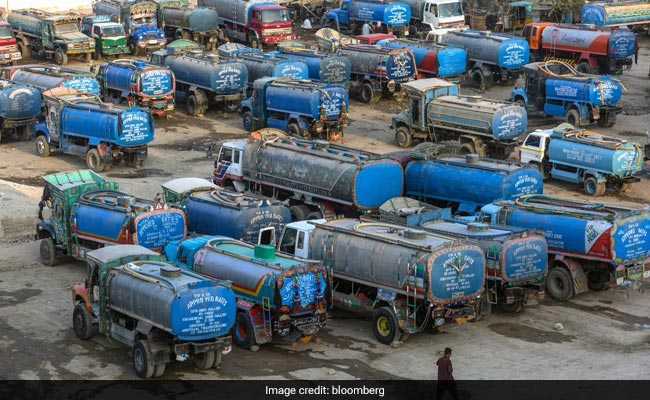 Across the border in India, government research indicates about three-quarters of people don't have drinking water at home and 70 per cent of the country's water is contaminated. The latest dispute is over hydroelectric projects India is building along the Chenab River that Pakistan says violate the treaty and will impact its water supply. Pakistani Prime Minister Imran Khan is sending inspectors to visit the site on January 27. Prime Minister Narendra Modi - who faces elections in the next few months - has vowed to proceed with construction, and it remains unclear how the impasse will be resolved. Waiting for hours or going days without water supply is the new normal in some crowded South Asian cities. "Tensions over water will undoubtedly intensify and put the Indus Waters Treaty - which to this point has helped ensure that they have never fought a war over water - to its greatest test," Michael Kugelman, a senior associate for South Asia at the Woodrow Wilson Centre in Washington said by email. "The prospect of two nuclear-armed rivals becoming enmeshed in increasing tensions over a critical resource like water is unsettling and poses highly troubling implications for security in South Asia and the world on the whole," he said. For now, relations between India and Pakistan appear to be stable, and even looking more positive. Khan's six-month-old Pakistani government has sought to mend ties with India, and has said the country's powerful military supports those efforts - a notion greeted with scepticism in New Delhi. Still, all sides see the long-term risks of a conflict over water: Khan himself is attempting to raise $17 billion via the world's largest crowd fund for the construction of two large dams, one of which would be built in Pakistan-occupied Kashmir. In a region that's home to about a quarter of the world's population, failure to manage water shortages could be catastrophic. "Any future war that happens will be on these issues," Major General Asif Ghafoor, Pakistan's military spokesman, told reporters last year, referring to water issues. "We need to give it a lot of attention." The most serious threat to the water agreement of late followed a terrorist attack on an Indian Army camp in September 2016, when PM Modi stated that "blood and water and cannot flow together" and vowed to review the treaty. If PM Modi is re-elected "there's a possibility that water may become a tool to try bring Pakistan to heel," said Ashok Swain, professor of peace and conflict research and the director of research at the School of International Water Cooperation at Uppsala University in Sweden. Failure to manage water shortages could be catastrophic for India and Pakistan. "He may not do something immediately after resuming power but if relations with Pakistan deteriorate, by 2020-21, it's a possibility," Swain said. And although Pakistan's new political leaders are aware the two dams being built by India are only one part of its problem, "a water conflict with India can be a good way to hide their own mismanagement." India's Ministry of Water spokesman Sudhir Pandey didn't respond to phone calls, while Pakistan's Commissioner for Indus Waters Syed Muhammad Mehar Ali Shah was unavailable to comment. Pakistan, India and Afghanistan are among the world's eight most water stressed countries. Waiting for hours or going days without water supply is the new normal in some crowded South Asian cities. The Indus river, one of Asia's longest that originates in the Tibetan Plateau and flows into the Arabian sea near Karachi, has shrivelled to a shadow of its former self. Water scarcity has led to regular protests in cities from Shimla in India to Lahore in Pakistan. Most South Asian nations are heavily dependent on agriculture that consumes the majority of fresh water supply. Rice and sugarcane are grown by flooding the entire area with more than four feet of water. About 60 per cent of households in India rely on agriculture while about half of Pakistan's labour force is employed by the industry. 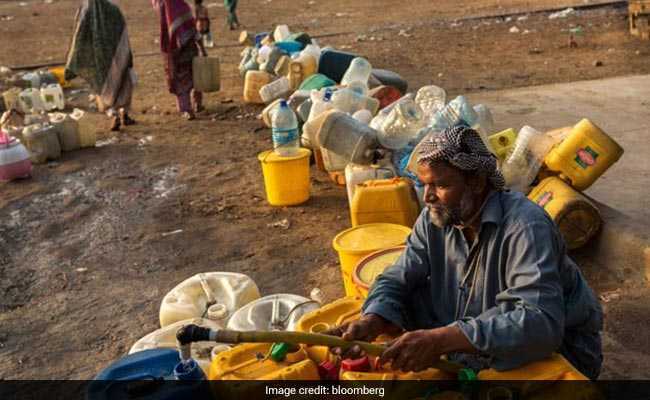 "South Asia has a water crisis," said Pervaiz Amir, a regional expert for the Stockholm-based Global Water Partnership, pointing to the cities of Karachi and New Delhi. "You immediately start a ripple effect, first it is poverty that will increase. In the southern areas of Pakistan, extremism and terrorism will increase." Global agencies have made dire predictions that Pakistan - despite having the world's largest glaciers - will face mass water scarcity by 2025. Already availability per capita has dropped by a third since 1991 to 1,017 cubic meters, according to the International Monetary Fund. The World Economic Forum rates the water crisis as the biggest risk in Pakistan, with terrorist attacks third on the list. "When water comes, women come from far, far away to fill water," said 30-year-old fisherman Abdul Qadir, pointing out dilapidated pipelines in Lyari's Khadda Market area. "There is a line of more than 200 people here." Last year a judicial report showed that 91 per cent of Karachi's water was unsafe to drink. Pakistan's poorest urban dwellers have access to only 10 litres per capita - just one fifth of the requirement, according to James Wescoat, a professor at the Massachusetts Institute of Technology. The World Economic Forum rates the water crisis as the biggest risk in Pakistan, with terrorist attacks third on the list. 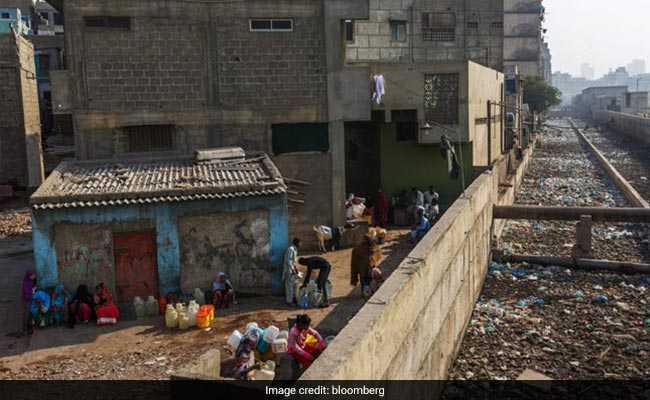 Waseem Akhtar, Karachi's mayor, told Bloomberg the city needs to fix widespread leakages and theft, but funding is scarce. 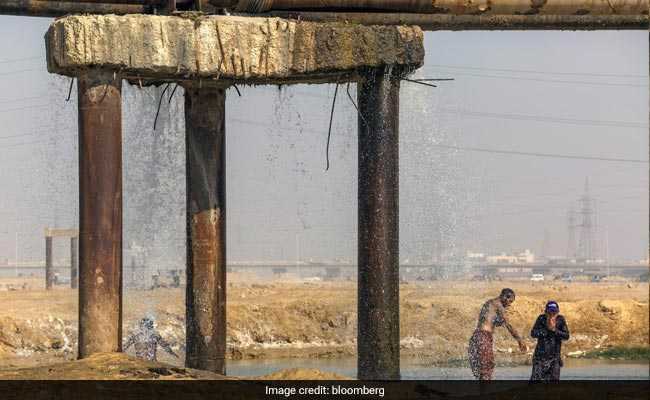 Neighbouring India's water demand is projected to be twice the available supply by 2030 and will lead to a six per cent loss in the country's economic growth by 2050, according to the government think-tank NITI Aayog. While a solution will need regional cooperation, there's been little coordination between India and Pakistan apart from their decades-old river-sharing agreement. Still, officials on both sides of the border recognise they need to act with urgency. "We have a near crisis," said S Massod Hussain, chairman of India's central water commission. "We need better management of our water resources."